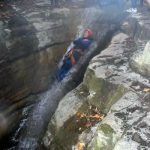 Discover and learn this fun sport known as canyoning. 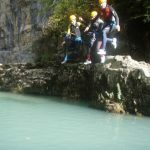 This sport consists in walking, swimming and jumping inside a river, through different natural obstacles. 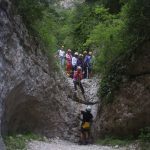 In some of them will require the use of rope to descend. 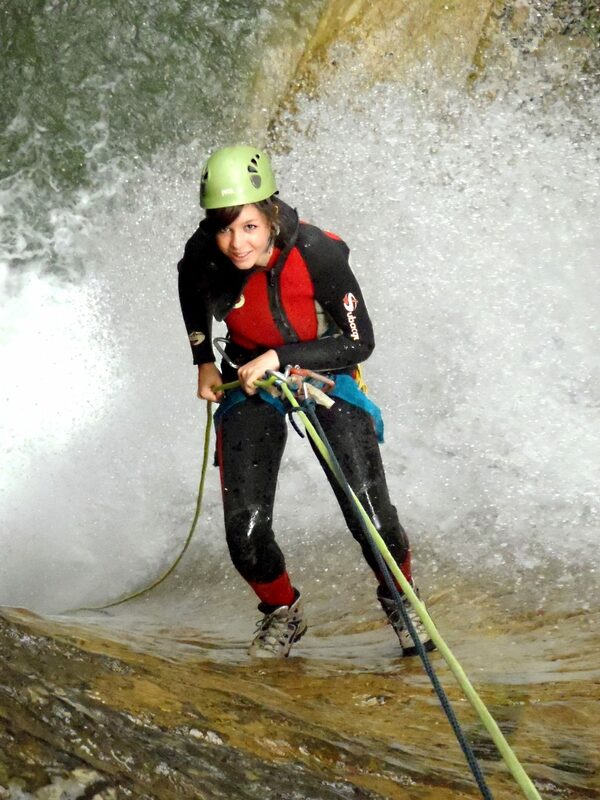 The canyoning around Ordesa offers us a variety of courses at every levels. The best season is from April to mid-October (always depending on the weather and melting, which varies yearly). 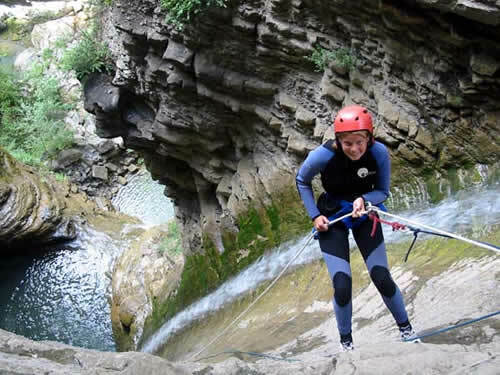 Canyoning in Guara. 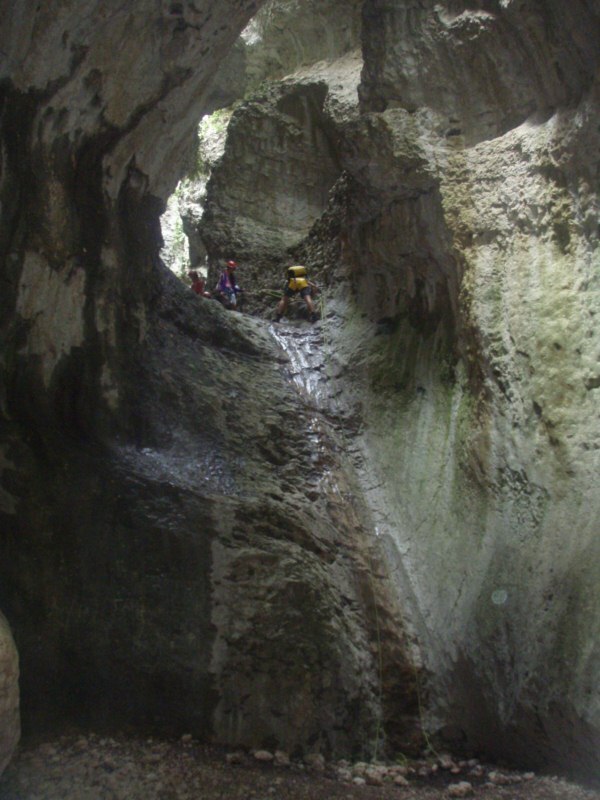 Sierra de Guara also offers a variety of canyons at all levels, with the proper time from March to late June. In autumn can also be optimal for the descent, depending on the weather. Level 2 (medium): Canyons also suitable for all audiences, but with a little more emotion. 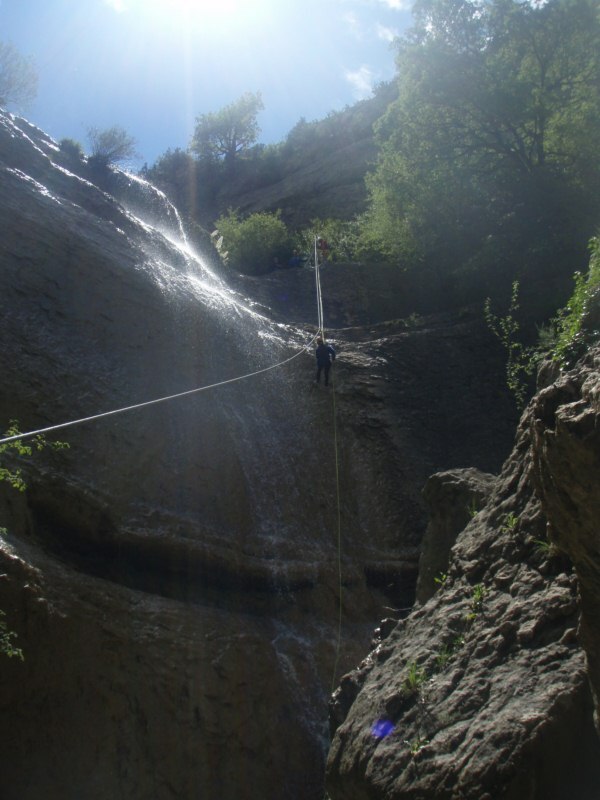 More abseiling and more height (up to 25-30 m), and longer breaks. Half day and full day. 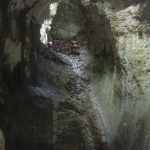 Furco Canyon, Sia, Trigoniero, Barrosa, Location–Escuain, etc. Level 3 and 4 (Advanced): Canyons longer and more difficult. 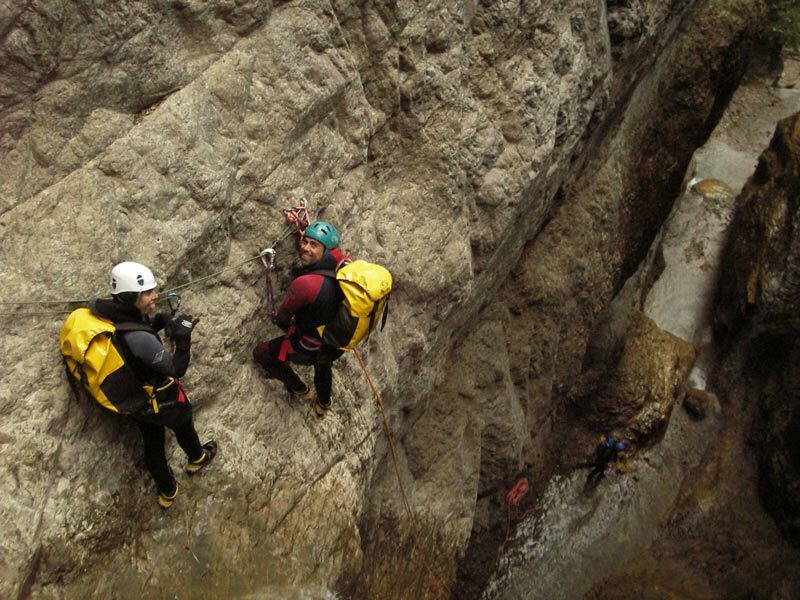 Up to 20 rappels lengths up to 50 m. Jumping up to 15 m. To perform this type of canyoning is necessary to have some experience in abseiling and canyons. Full day. 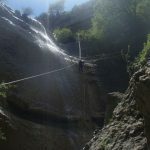 Lapazosa, Ordiso Gorge, Sorrosal, Consusa Superior, etc. 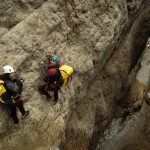 Level 4: Sorrosal, Carpín, Foz de la Canal, etc..
Canyoning Weekend in the Pyrenees and Guara: descend some of the best Guara canyoning in the Pyrenees or in 2 days. A must know how to swim. 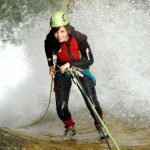 Wetsuit: we guarantee thermal insulation, buoyancy and prevents facilitates small bumps and scratches when touch rocks. Composed overalls–trousers and a jacket 5mm. Booties: neoprene socks that isolate us from cold feet. They are used as a normal sock. Hull: It protects us from blows to the head as they move through slippery slope, and also on the possible falling rocks due to wind or movement of people or animals above us. Approved by the UIAA / CE. 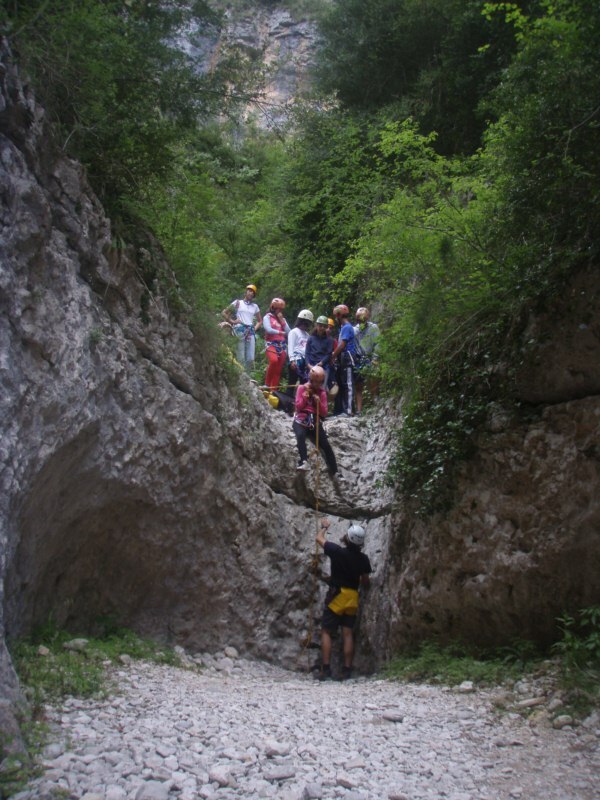 Harness: we will use to rappel (descend by rope) or ensure and prevent falls of great height. With lifeline or lanyard-type and eight descender. Approved by the UIAA / CE. Carabiners: will take one type HMS insurance, and two more, both for lanyards. Lanyards: always on hand to ensure when necessary. 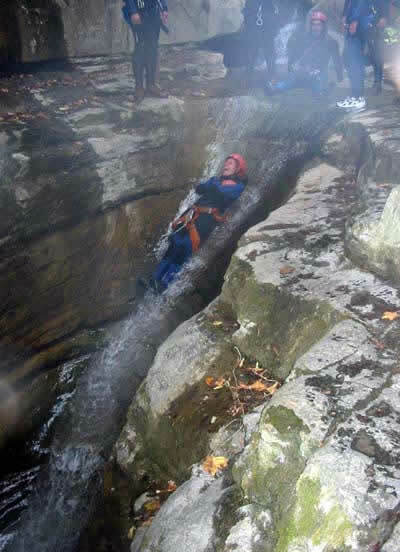 Descender (type eight): allows almost effortlessly down by a rope, and thus control the rate of descent. 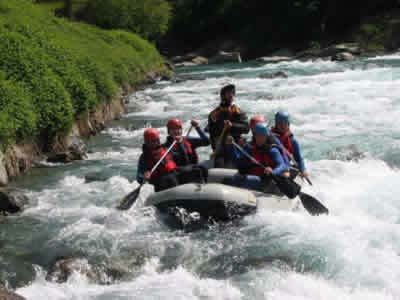 Backpack: We will use backpack full day activities for water transport, with watertight kit cans and ropes. Watertight container: to carry material that can not get wet (car keys, first aid kit, mobile phone, lunch, etc). 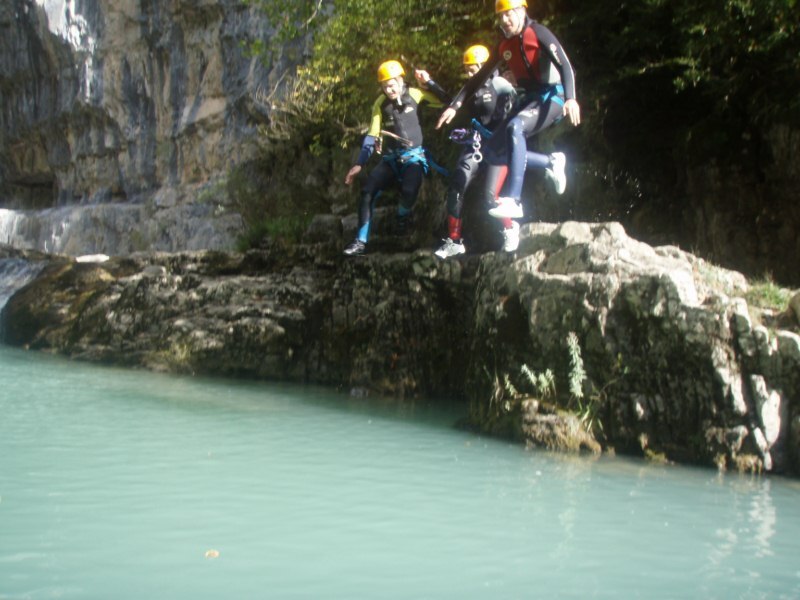 Suit: all that is necessary under the neoprene and also as a pledge for the approach and the return of the canyon. Shoes: will need shoes that can get wet and good foot hold. Best shoe and boot that with hard soles and if possible mountain. If you have hiking boots best, because they protect the ankle. The canyons ground is slippery. Thermal clothing: if colder times or higher throughput, we recommend the use of thermal wear, any jersey plastic (polyamide, polyester) will serve. Not so cottons, which are soaked and cold cause us to spend more. Towel: to dry off and change clothes at the end of the activity.